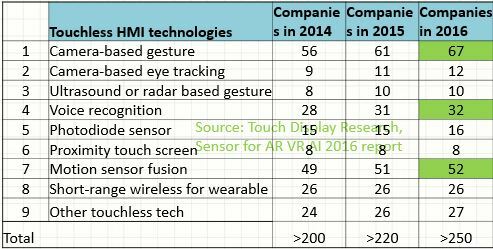 sensor market Archives - Touch Display Research, Inc. I just attended the Sensor Expo & Conference 2016, which was held by Questec LLC in San Jose, California this week. It’s a very good conference with 60+ technology presentation sessions and 300+ exhibitors this year. 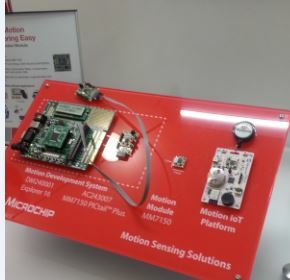 There are over 20 sensor technologies showcased in the Sensor Expo: motion sensor hub (accelerometer, gyroscope, etc), photodiode sensors, proximity touch sensor, P-cap touch sensor, camera-based face recognition, MEMS-based voice sensor, short-range wireless and other sensor technologies. 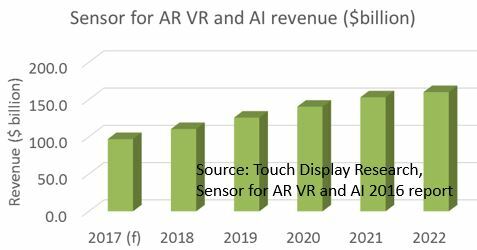 In the recently published “Sensors for Augmented Reality, Virtual Reality and Artificial Intelligence market 2016 Report,” Touch Display Research forecasts that sensors for AR, VR, and AI market will be $97 billion in 2017, and will reach $160 billion in 2022. Sensors are very critical components for augmented reality, virtual reality, and artificial intelligence devices. For example, the HTC Vive has 80 integrated sensors. AR, VR, and AI are the next big things. Apple, Google, Microsoft, Amazon, Samsung, LG, Intel, Qualcomm, Facebook are all working on these technologies. The “Sensors for Augmented Reality, Virtual Reality and Artificial Intelligence market 2016 Report” is available immediately and includes a PowerPoint file (over 300 pages) and an Excel database. This entry was posted in sensor, touchless control and tagged AR VR, artificial intelligence, sensor, Sensor Expo, sensor market on June 22, 2016 by jennycolegrove. I just returned from AWE (Augmented World Expo) 2016 conference. AWE is the largest event dedicated to AR, VR and wearable technology. At AWE 2016, ODG (Osterhout Design Group) showcased its smart glasses with gesture control. Touch Display Research had a chance to try on the R-7 smart glasses and test the gesture control. Figure: Dr. Colegrove tried on the ODG smart glasses at AWE 2016. 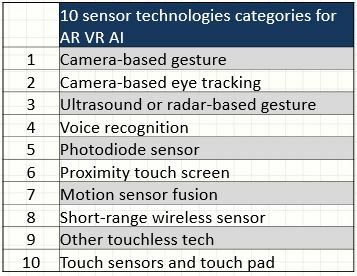 In the recently published “Sensor for Augmented Reality, Virtual Reality and Artificial Intelligence 2016 report”, Touch Display Research profiled 67 companies working on camera-based gesture-control. This number has increased from 56 companies just two years ago. Figure 2. Companies working on gesture control, voice recognition and other touchless HMI sensors. More analysis and review can be found in the “Touch and Emerging Display report” June 2016 issue. This entry was posted in artificial intelligence, Augmented reality, Gesture control, Glass, Head mounted display, smart glasses, touchless control and tagged AWE, gesture control, ODG, sensor, sensor market, smart glasses, touchless HMI, voice control on June 2, 2016 by jennycolegrove. Today Google announced the Google “Home”, a voice recognition device that will compete with Amazon’s Echo. Similar to Echo, the Google Home could respond to users voice commend, play music, control the smart thermostat Nest, search the internet etc. It’ll be available by end of 2016. Price is not announced yet. On the same day, Google also announced two voice control based apps: Allo and Duo. Both tap into Google Assistant platform. Google claims their Google Assistant platform is the best voice recognition system. Voice recognition is also called voice command, or voice control. It is a very critical component for augmented reality, virtual reality, and artificial intelligence devices. Apple, Google, Microsoft, Amazon, Facebook are all working on this technology. In the newly published “Sensors for Augmented Reality, Virtual Reality and Artificial Intelligence market 2016 Report,” Touch Display Research analyzed over 30 companies working on voice recognition. This report also analyzed the other 20 sensor technologies for augmented reality (AR), virtual reality (VR), and artificial intelligence (AI) market. These sensor technologies include: camera-based gesture control, ultrasound and radar based gesture control, eye tracking, voice recognition, photodiode sensors, proximity touch screen, motion sensor, short-range wireless, other touchless technologies, touch sensor and touch pad. Over 200 companies working on sensors, augmented reality (AR), virtual reality (VR) and artificial intelligence (AI), are profiled in the Excel database. This entry was posted in artificial intelligence, Augmented reality, Google, sensor, virtual reality and tagged AI, Amazon, Apple, AR, artificial intelligence, augmented reality, Echo, facebook, Google, Google Home, Home, Microsoft, sensor, sensor market, virtual reality, Voice recognition, VR on May 18, 2016 by jennycolegrove.